I must say that my heart skipped a bit when I logged into Flickr yesterday and saw that I had gotten an email from Flickr HQ. 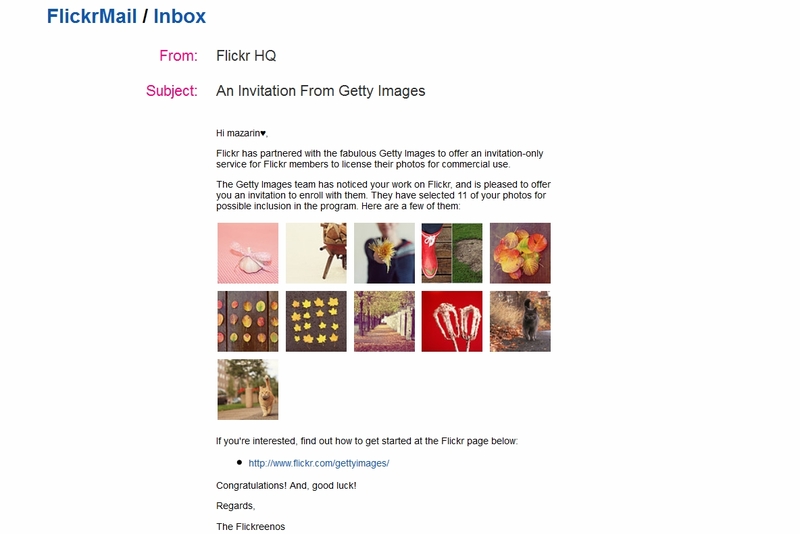 It was an invitation from Getty Images. Sure, they do send out such invitation to several person, so it’s not that special, but to me it means a lot. On many occations, I have been thinking of stock photography and if I should participate in such a thing. My thinking has always ended with a no. I think I deep, deep down have thought that I’m going to do something on my own with the photograhes I got; either publish them in a book, open a gallery and sell them or sell them online myself. Even deeper down, I think I’ve known that it’s not very likely that that’s going to happen, but still I’ve said no to the stock photography option. Some time last year, I think it was last summer I thought about stock photography again. I found this group on flickr hosted by Getty Images. A few times a year you could post your best photos into the group and then would Getty Images look at them; and if they liked what they saw, they would most likely give you an invite to join Getty. The group was, at that time, closed for submitting photos, and has been that ever since. In the discussion forum in the group, people said that you could get an invite from Getty despite the group being closed for submittions; Getty do browse Flickr for photos. I didn’t really think that would happen. There is a lot of photographers out there. But hey, it did happen. I got an invite! *happy dance* Last night I did set up an account over at Getty Images. I did it without thinking. I think I was so excited that I left all thoughts about stock photography behind and just went for it. So what has changed from then to know? I’ve come to the conclution that I most likely never will open a gallery or publish a book with my photos. I’ve also come to the conclution that stock photography doesn’t rule out other options; you can do both. I can have my shop open at Society6 and still do stock photography. I just have to keep track of what I post where, so there isn’t any conflict with my photos. Above you can see which photos Getty wants. You can also view them at this set over at Flickr. I’ve decided to include 10 of them. Getty Images contains a lot of photographes; it might be millions for all I know. The likelyhood for me to sell anything over there is slim, but it’s not impossible. After all I will have 10 photographes there; maybe more later. The reason for joining Getty is not to be rich and famous. Part of me does it for fun and part of me do it because I believe in my own photographes and I think they deserve a chance to be used/bought. I must say so far 2012 has been good photographing-wise; I’ve opened an online shop and now I’m enrolled with Getty Images! I was invited about 6 months ago. I’ve sold one picture since then (currently have about 20 with Getty). That’s it. But my pictures tend to be a little unique and probably difficult to sell. Do check out the Getty Flickr groups – they’re pretty informative bunch. You should have access now. And be careful in what you sell on your shop vs Getty – they disallow selling of “similar” pictures, although it’s a bit of a gray area, so … when in doubt, ask.